Your body, soul and mind will thank you. The power of gold isn’t just limited to your clothes or jewels. The colour plays a crucial role in your health, all thanks to one magical golden drink. A powerful combination of turmeric, coconut milk, some spices and a dash of coconut oil, this century old Ayurvedic drink is all you need to cure 90% of your health issues. The beauty of golden milk lies in its simplicity. It’s made with everyday cooking ingredients, doesn’t cost more than a few bucks and tastes like a creamy smoothie with a hint of spice. But this drink is more than just a healthy night-time brew. It is known to reduce inflammation in joints, boost your immune system, maintain a healthy heart and cardiovascular system, help lose weight, and keep blood sugar levels in check. Make it a part of your daily diet and your body, soul and mind will thank you. The milk is best consumed while it's still warm preferably at before bed. There's no restriction on playing around with the basic recipe. You can add a bit of honey to sweeten it or spice it up more by adding a dash of freshly ground black pepper or cardamom when you are warming up the milk. The basic recipe, according to Wellness Mama, is simple and takes less than 5 minutes. First, blend all ingredients in a high-speed blender until smooth. Add some variations to the recipe. Pinterest is full of creative souls who play around simple recipes and turn them into exciting and delicious snacks. 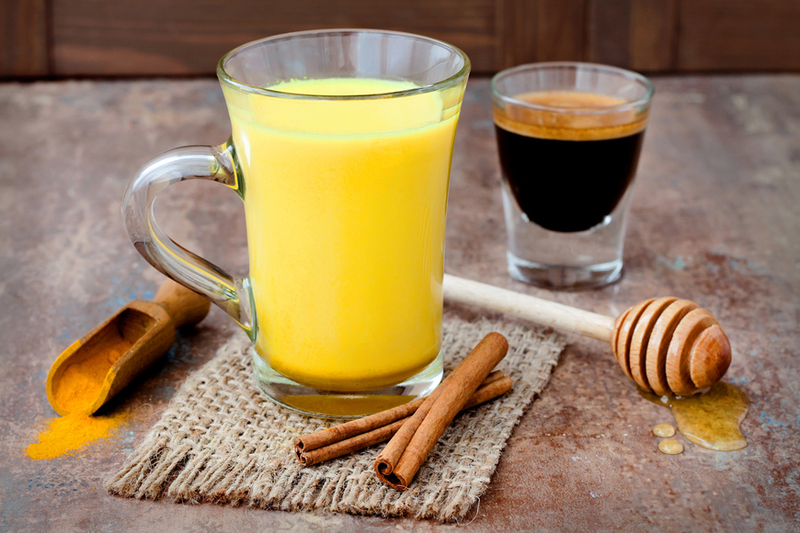 Here are some inspirations that will spice up your golden milk intake. Loaded with superfoods like turmeric, nutrients and detoxing properties, these quick and easy snack bites are the perfect wholesome snack to enjoy anytime. Made with turmeric, ginger and cinnamon over ice, this golden latte looks delicious enough to qualify for Instafood updates. Here's another one to satisfy your late-night coffee cravings.